ATTENTIONE POUR VOIS UNE SILVERED SCEATTA FOTO NUMERO 686 INFORMATION LE MISTRIÊUS ROYAL MEROVINGIN LE ROI THIERRY III EST LE ROU DES FRANCS DE NEUSTRIE PUIS RIU DE TOUS LES FRANCS 687 à 691 A.D.---------INFORMATIONE AVECERE LE SILVER RING INITIALS T o T ??? 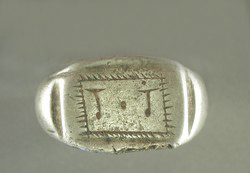 A Roman silver finger-ring of Henig's Type XI with plain D-shaped hoop and broad, flat, sub-rectangular bezel. Within a simple channelled border is a rudimentarily incised sub-rectangular panel engraved with the letters ToT, the ‘o’ being rendered simply as a stop (thus, T.T). Although a little post-discovery cleaning appears to have taken place the ring displays clear evidence of wear, most noticeably on the shoulders and bezel margins. Rings with the ‘TOT’ inscription are distinctively Romano-British and concentrated in Lincolnshire. The inscription is usually regarded as an abbreviation of the Celtic god-name Toutatis (or Totatis), a deity who was often conflated with the Roman god Mars (M. Henig and J. Ogden Antiquaries Journal 67, 1987, 366-7). Date: 2nd – 3rd century AD. Dimensions: external, 27.4 x 21.9 mm; internal, 20.5 x 17.2 mm; bezel width 14.7 mm. Surface metal analysis conducted at the British Museum indicated that the silver content is approximately 92%.